Say your vows in front of a brilliant backdrop of tree-covered mountains, or celebrate your love in a spacious and beautifully appointed ballroom. 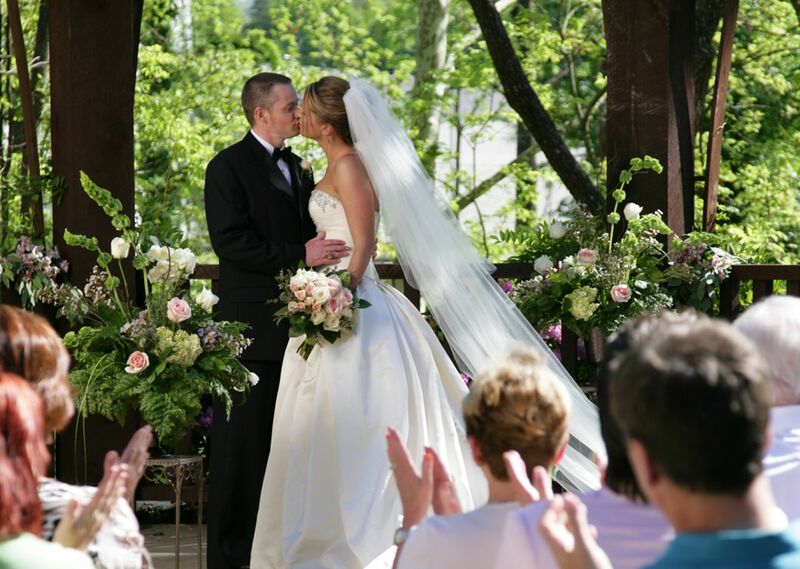 RiverStone Resort offers pristine outdoor and indoor spaces filled with Pigeon Forge charm, character and comfort for the wedding of your dreams. Guests gather around on a spacious outdoor patio, basking in the beauty of the outdoors and savoring a tree-filled backdrop. Your vows are echoed only by the sounds of nature as a tree-shaded mountain stream murmurs softly and a waterfall babbles in the background. Our outdoor wedding patio is the perfect place to host a memorable ceremony, reception or other function. Prepare yourself among friends and family in our spacious Bridal Suite before walking down the aisle on your special day. Our indoor ballroom is ideal for winter weddings or larger gatherings. With 3,600 square feet of total space, two large screen projectors and cutting-edge audio/visual capabilities, your ceremony, rehearsal dinner or reception will be elegant and tailored to meet your every need. To get started planning your Pigeon Forge wedding or celebration, please submit an RFP/Inquiry.